A rustic bread salad is one of life’s simple pleasures. I could live on the delicious juices that flow from salted cut ripe tomatoes and cucumbers, add some torn day old homemade sourdough and you have a meal. Leftover sourdough flabreads from last week’s recipe inspired me to try out the Lebanese fattoush from “Jerusalem” by Ottolenghi and Tamimi. “Jerusalem” is my book of choice to cook from for February. Panzanella, an Italian style bread salad is a firm favourite on our week night dinner table over summer and as the season is just right for full flavoured tomatoes, cucumbers and soft leafed herbs I thought it was worth trying an alternative. I was intrigued by the method of producing a mild homemade buttermilk for the salad by combining and fermenting milk and yoghurt. This needs to be started the day before, but other than that, despite the long list of ingredients the method for putting this salad together is very straightforward, chopped vegetables and herbs, torn bread and a well balanced dressing. In deference to the gut friendly diet I follow, I made one minor adjustment to the recipe, replacing 2 garlic cloves and a little of the dressing oil with some garlic infused olive oil. Move over Panzanella, Na’ama’s Fattoush is stealing the limelight. note: I intended to add a link to my version of Panzanella but it seems I’ve never shared it with you. While the tomatoes are at their best I’ll put that right. If using yoghurt and milk, start at least 3 hours or up to a day in advance by placing both in a bowl. Whisk well then leave in a cool place or in the fridge until bubbles form on the surface. What you get is a sort of home-made buttermilk but less sour. Tear the bread into bite sized pieces and place in a large bowl. Add the fermented yoghurt mixture or buttermilk, followed by the rest of the ingredients. 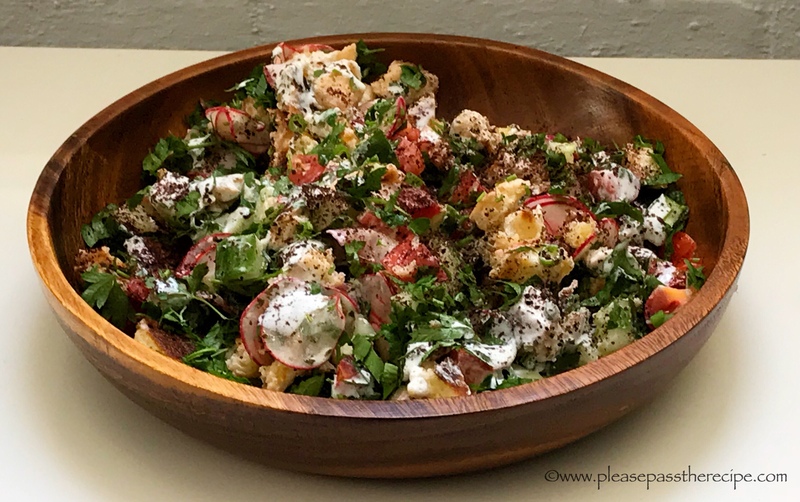 Spoon the fattoush into serving bowls, drizzle over extra olive oil and sprinkle with sumac. I seem to be two weeks behind you, enjoying your lead in the sourdough flatbread and fattoush parade. LOL, where will this delicious sourdough parade head next. Delicious, Sandra. Dearly as I love panzanella, it’s great to have an alternative. Lovely! I began with panzanella and ‘graduated’ to fattoush . . . have Ottolenghi’s book but it has been awhile since I opened it . . . have all the ingredients and, for me, this would be a full meal! Shall make over the weekend and with garlic 😉 !! Gorgeous. I can just taste it! Dried mint? Is there such a thing that isn’t like dust? Is it really minty? I use locally grown organic peppermint tea when I need dried mint, which isn’t very often. I drink a lot of peppermint tea. The leaves are it’s intensely minty, and in pieces, not ground. We dry our own from the garden, Mimi, and it holds its flavour well. I’ll remember this for summer. It does seem a bit acidic with buttermilk, lemon juice and vinegar. Large Turkish flatbreads are about a kilo each here. This entry was posted on February 15, 2018 by ladyredspecs in Cooking, FODMAP diet, Food, Light Savoury Dishes, Main Meals, recipes, side dishes, Side Dishes & Salads, sourdough bread, vegetables, Vegetarian and tagged bread salad, cucumbers, fattoush, FODMAP diet, herbs, Lebanese, salads, side dishes, summer tomatoes.